Forum is ultra pear shaped in Safari on iPhone. Perfectly fine in Opera Mini on iPhone. Opera Touch and Puffin Lite on iPhone both pretty pear shaped. 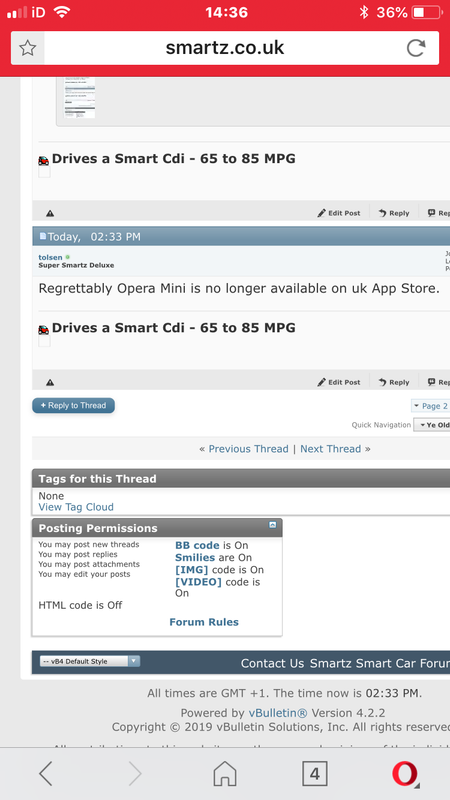 Regrettably Opera Mini is no longer available on uk App Store. Still looks normal in Opera Mini on iPhone. Last edited by tolsen; 07-04-2019 at 02:49 PM. This behaviour has been happening for a long time, the problem is with the secure (https) version of the website. If you try to establish an https connection to this forum it completely messes everything up from that point until you clear all related cookies out. I discovered this a while back when I posted a https link which messed up the rendering on mine and other peoples browsers, and the only fix was clearing cookies. The non-secure version is the only one that displays correctly, which is very poor. I just added Https:// to the working version link on my mac book pro and it changed to the text based version, and I couldn't get the normal version back whatever remembered link I used. So then I deleted the website data (cookies) and typed smart in again and the normal version was back again !